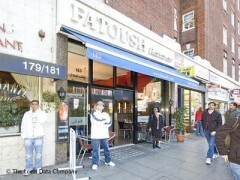 About: Fatoush serve a wide selection of Lebanese dishes to eat in or take away. They do not serve alcoholic beverages. A delivery service is also available. By far the best on edgware road. I have been coming to this place for years and the quality had been consistently good. Compared to other places on the street, it's not pricey either. Must have: stuffed chicken with mince lamb rice. The only recommendation would be to upgrade the interior a bit. I was told of this restaurant by a friend and her family who have been going for years and raving about the chicken shwarma sandwich. IT IS THE BEST! The staff is very nice and pleasant. Burnit food and coal? I don't know what these other writers are talking about. You can watch them make the food, all of which is fresh. I highly recommend this restaurant. I'll be there again in May and can't wait to go to Fatoush! I travelled from 2 hours away to this restraunt. All other restraunts in Edgware Rd were packed. Sat down and the guy took our orders. EXTREMELY OVER PRICED. They were also selling multipack cans for £2 each! When the food came, it was cold and burnt. Thought it'd be fresh, but I was wrong. We told the guy and he said he will refund the food. The bill came up to £160. We raised this issue and he denied saying he will refund it and demanded full payment. After 1 hour of a heated dispute, we paid £93 and left. After that we went to East London and ate Fried Chicken & Chips...which was MUCH better to be honest. NEVER EVER EVER EVER GO THERE. TRUST ME. Got food poisoning from the neighbouring Fatoush Express. Fingernail in the aubergine dip! I would not recommend going to a Fatoush, I've been ill for 5 days as a result! Very friendly with excellent food and service. Not only my favorite Lebanese restaurant in the world but my favorite any restaurant in the world. It's a family run place and extremely welcoming with excellent fresh food. Make sure you ask for the Taboulleh. Saw good reviews for this restaurant, so decided to go with friends. Turned up at the restaurant and it was very quiet. The service was quick as we were the only ones there - however, the food was vastly over priced for a tiny portion of food and the quality was poor. Unfortunately this restaurant was not what I expected - some of the staff kept pacing up and down the aisle - which made us feel uncomfortable. The food was a bit cold and burnt. The environment seemed very old and run down - very small tables. The smell of Shisha and burning coal drifted our way whilst we ate indoors which was very annoying. It was funny how, when we finished eating we went for a walk on edgeware road and found all the rest of the Lebanese resturants full of people! I guess next time I should have a look around the area. Tired, re-heated food,poor service. Will never go here again. We should have known that this place was no good, when every other Leb. restaurant in the road was packed, and this was empty. Best restaurant EVER! Warm, kind services and amazing food. They have beautiful banana and strawberry smoothies- first time? TRY IT. Can't relate to the negative comment from 2006. I have been coming here over the last three years, usually in groups of 4 - 10 and always receive the warmest welcome and best service. Never had to ask to have my Shisha coals replaced - it just happens!